New Year, New Habits: Decluttering an elderly person’s home. What to keep, donate, toss. As you age, having a place for everything in your home is critical to maintaining your health and safety. But it can be emotionally difficult for seniors to choose what to keep, toss, or donate—without support. 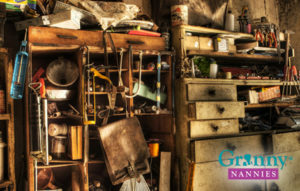 Check out these tips for helping your elderly loved one clean up a messy home and improve the clutter factor. Implement reusable shopping bags for the grocery store and other regular errands, so they don’t stock up on unnecessary plastic bags at home. Try to eliminate plastic water bottles in the house and make sure they have quality filtered water from the tap or a refillable water cooler. Consider installing a compost pile outside for coffee grinds, egg shells, banana peels and other perishable waste. Similar items belong in one place. For example, it’s easier to have all of your pens and pencils stored in one drawer that makes sense, in the kitchen or by your office. That way, when you need one, you know exactly where to it. If you have enough stuff in good condition, you can call a local resource like Good Will and arrange for them to pick it up. Their on-line tracking of donations makes it easier to file as a tax deduction. And your old stuff is going to benefit the lives of others in ways you can’t imagine. Funny how the fridge and kitchen cabinets can get loaded with products, gadgets and stuff you bought with good intentions, but never use. If it’s food, check expiration dates and discard what’s past its prime. Be honest about leftovers in the freezer that will never be eaten. After a defrost, give the fridge and freezer a thorough yet gentile wipe down with warm water and a mild cleaner on the interior. If there are still-good canned foods that will never get touched, donate them to a food pantry.